I absolutely adore roasted vegetables. I also absolutely adore minimal cleanup. Most of the time when I cook, the kitchen is an absolute disaster! Knives, cutting boards and bowls everywhere…measuring cups and spoons…spices, you name it! Cooking is messy. The alternative – purchasing pre-made food – is not only costly, but often not very healthy. A popular trend now, which aims to reduce the number of dishes/utensils used, is “sheet pan” meals. The idea is that you simply line a baking sheet with parchment paper, and dump everything you plan to cook on it, and you’re done! With our local farmers’ markets brimming with beautiful produce, this is a perfect time to try out one of these sheet pan meals. 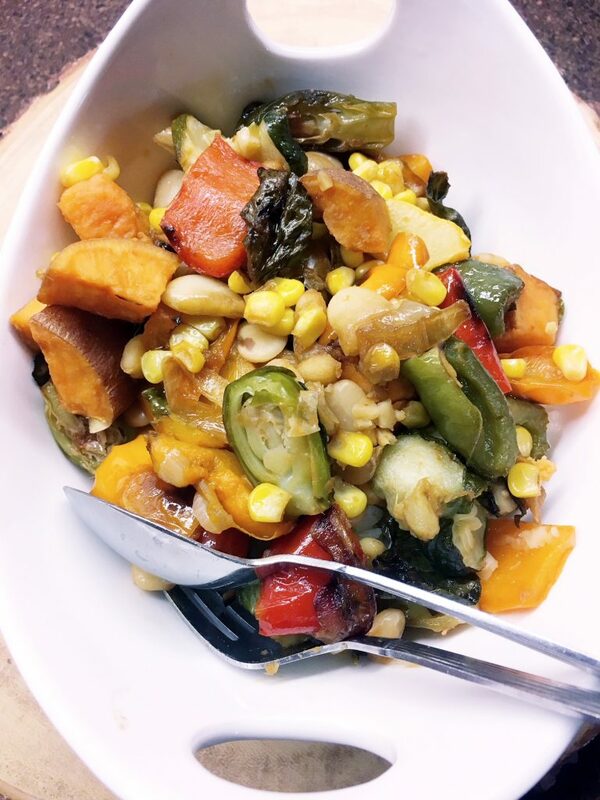 For this recipe, I opted for local veggies, and then near the end, I tossed in a can of cooked butter beans (lima beans) to add a little more protein to the meal. We were happy with the results, and it made two meals for us. The first time we enjoyed it served over rice, and the second night we used it as a side. The flavours had an opportunity to intensify overnight which made them even more tasty. For this recipe I used a glaze from The Roasted Root. I often make my own sauces/marinades/dressings, but time did not allow for that this time, so I used the great glaze recipe by Julia Mueller. It uses Tamari, which is similar to soy sauce, but is gluten-free. 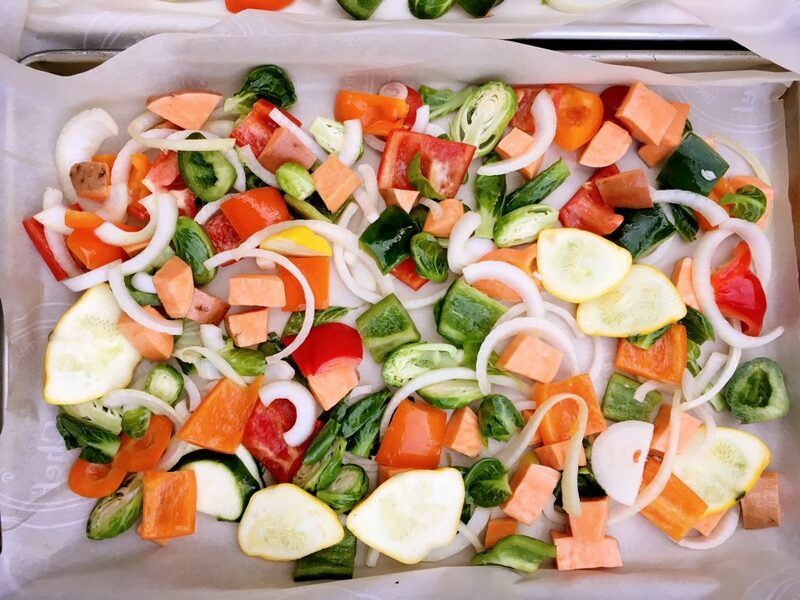 The glaze can be made while the veggies are roasting, then added once the roasting is done. We also added corn and butter beans for the last several minutes of roasting. We enjoyed this over a bowl of rice, but it would also be yummy paired with quinoa, over pasta, enjoyed as a wrap/burrito/taco…endless options! Once veggies are cut (with exception of corn and beans), toss with oil and salt and place on two parchment lined baking trays. Roast in preheated 400 degree oven for about 35 minutes…turning once through roasting…veggies should be starting to brown nicely. Add corn and lima beans and return to oven for about 5 minutes….they won’t take long to warm through. While veggies are roasting, prepare glaze. Combine glaze ingredients in a small saucepan and bring to a slow boil. Reduce heat and whisk glaze for about 5 minutes. Remove from heat….sauce will continue to thicken. Once veggies are done, toss with glaze and serve over rice or as a side dish. Enjoy!